The most basic rules of etiquette are clear- you should not use your mobile phone during a Thanksgiving meal. The rules would also state that you should not use your phone while spending time with family before and after the meal. Admittedly, that second one is a little tougher to follow, especially if you have family members with whom you only interact on this single holiday each year and you are not good at chatting about the football game on TV. However, there is one use of a cell phone that is not only appropriate, but will also significantly improve Thanksgiving or any holiday that involves a large, home-cooked meal. Using it to access one or more of the many planning and recipe apps to help plan and prepare what, for some people, can be an overwhelming feast. A few years ago I used a popular note-taking app to list out everything I needed to do to host a large Thanksgiving dinner including my annual menu, shopping list, favorite recipes, and even simple tips/reminders that help make the day flow smoothly and less stressful. Then each year, while eating leftovers the following day, I tweak my notes with improvements or lessons learned. Now there are no loudmouth family members complaining because I didn’t make their favorite dish. I have also fine tuned my timing so that all the food is ready more or less at the same time by simply counting back from the scheduled meal time to when I should begin preparing each individual menu item. There are a number of recipe apps, note taking apps, and posting boards to choose from. I prefer a note taking app because it allows the most flexibility. As a novice cook, I recommend you try a couple until you find one that works for you. I also offer the following tips and menu from my own notes to help you get started. Keep the traditions – cook what keeps and passes on memories even if they are a bit hard. One person’s favorite dish makes their holiday more special. Go grocery shopping on Sunday to be completely prepared ahead of time and avoid the rush on Wednesday and allow turkey time to thaw. If serving more items than you have room for on the stove, then use a steamer to cook the veggies. By simply adding lemon juice and Poultry Seasoning in the water then tossing them in olive oil with garlic salt you save time and they taste great. Stuffing tastes better with stale bread – remember to rip open a loaf and leave it out on Wednesday night. Brine Tuesday night until Wednesday night or Thursday morning depending on meal time. Gone are the times where this referred to people only. Being able to get in touch with friends, family and loved ones on the other side of the globe in an instant and at any time of the day comes as a given to every digital native. For those who were brought up with the amenities of the Internet, mobile communication and smart devices constant connectivity is just as natural as breathing. Yet it’s not only people anymore who are connected to their kind via internet, mobile communication and smart devices. Advancing technology and the decline of sensor costs have given way to a whole new concept: the Internet of Things or ‘IoT’. IoT is a cloud-based, data driven ecosystem and its constantly communicating inhabitants are both inanimate objects as well as living creatures. Or simply put, everything that can be connected is being connected: refrigerators, washing machines, cars, industrial equipment, trees, city lights, our heartbeat and blood pressure, and cows. That’s right—cows. Up until now cow farmers were facing a sleep-depriving problem when it came to the calving of their herds: due to difficulties or a lack of speedy assistance, one out of every fourteen cows died in the process of giving birth. For the farmer that means it was either spending hour-by-hour alongside the animal in order to be alerted in time or risking the loss of mother and child by not being around. Yet, whenever there is a problem, there is also a solution and in this case, the solution was IoT (or IoC, the Internet of Cows, as you should say). When in 2010, Niall Austin, member of the Moocall founding team, lost a cow and calf due to a difficulty during childbirth, the idea for the Moocall calving sensor was born. What was theory back then proved to be true soon after: if there was a sensor that could monitor the tail movements of the cow (apparently they increase when calving is imminent) and that could alert the farmer so he can assist the birth or call a vet if necessary, then the bovine mortality rate could be drastically reduced. A few prototypes later, the finished sensor is a lime green device that’s being clipped onto the cow’s tail and comes with the corresponding app for smartphone or tablet. About one hour ahead of birth, it sends a notification to the farmer who is, until that time, now able to look after the productivity and efficiency of his other farming operations. Since its launch in 2015, over 13,000 devices have been sold and helped over 100,000 calves into this world – safely, needless to say. After much ado, it appears that small cells are finally beginning to be deployed in earnest. The wireless industry has been talking about mass densification and exponential increase in the number of sites via small cells for the last few years. Now it appears the trucks are beginning to roll in significant volume. And that is good news! However, as an industry, we need to continue to climb the small cell learning curve in both the development of the small cell equipment and in the deployment of that equipment on a site-by-site basis. Just as OEM’s will surely continue to improve small cell technology and work to reduce the size of equipment, service companies and infrastructure providers are still working to develop and standardize workable solutions for backhaul, power, zoning/permitting, attachments rights, etc. And all this needs to be done at a scale and pace to keep up with the exponential demand for bandwidth. With Mark’s permission I share how he illustrates the evolution of small cells on the Gartner Hype Cycle. This is not only true of the technology, but also of the deployment process for small cells. At Md7, we watched the iPhone act as a Technology Trigger for network capacity and thus network densification. We ran up the Peak of Inflated Expectations in 2012 and 2013. And, after a couple of false starts, we retrenched as we went through the Trough of Disillusionment. Currently, in the second half of 2016, Md7 has encountered a new, tempered excitement as we manage several small cell deployments in the USA and in Europe and climb our way up the Slope of Enlightenment. It is exciting to be a thought leader in the development of new deployment models and processes as we grow through this significant evolution. If Mark Kelley’s version of Garnter’s illustration holds true, and I believe it will, then the best is yet to come. Over the next three to five years, small cells will transition into the Plateau of Productivity. This is the phase where small cell deployments become widespread, the technology and networks are optimized, the integration of cellular and Wi-Fi plays-out and deployment models become streamlined. And, on top of all that, we will continue to evolve toward 5G. It is a very exciting time to be in the wireless industry. Spotlight on Wireless Technology: When Will the Smartphone Finally Replace Credit Cards? By my count there are currently four different ways to make a purchase when standing in line at a retail store–not counting cash or checks. In many countries, swiping is already a thing of the past and it soon will be in the rest. The static nature of the data embedded in a strip that is swiped is simply too easy to steal. Due to this outdated technology, my personal visa had to be replaced twice in the last six months. The encrypted data in a chip embedded card is not static so even if it does get copied, it changes for every transaction so it is nearly impossible to counterfeit. This technology, known as EMV (an acronym for “Europay, MasterCard, Visa” who created the technology), is widely used throughout Europe and is relatively easy to use. However, in the USA, not enough retailers have invested in the terminals at each point of sale. Many of the companies that have actually installed the terminals are not yet using them and have a sign telling you to use the swipe instead. 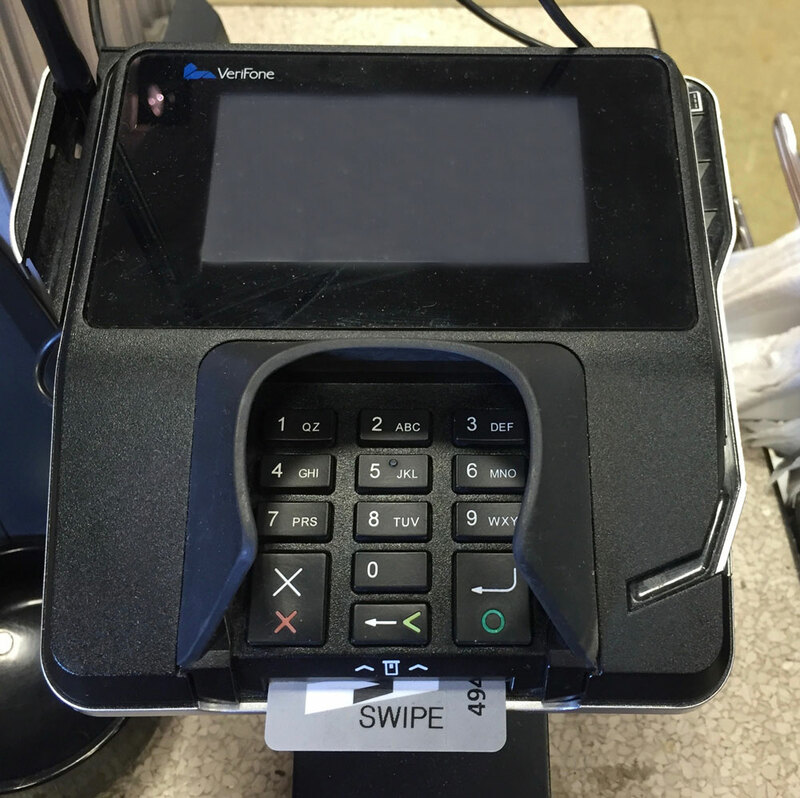 They may even have tape over the card slot to prevent you from inserting your card. I have been scolded by a handful clerks for vacillating between the swipe and the insert! Using a QR scan code within a specific retail app is an easy way to make frequent purchases and accumulate loyalty points at places such as Starbucks or Subway sandwiches. But who wants to thumb through a bunch of unique apps to find the specific one that is needed to pay in a particular location. Not to mention that some require you to “load” your app by prepaying so they get interest-free use of your money. Clearly the best solution is holding your phone near or tapping it against a payment terminal and paying via your account information stored securely in your phone. Mobile payments use the same EMV technology as the chip card, and have a second form of authentication by requiring your phone PIN or fingerprint. This can also be combined with an expanding number of loyalty programs. Mobile payments are faster, easier, more secure and I can consolidate all my loyalty cards. Woohoo! So what the problem? Well, not every retail location has invested in the terminal to process mobile payments. In the USA, the liability for fraudulent charges recently shifted from the bank to the retailer. This is providing the incentive for retailers to incur the expense to shift from traditional cards to EMV chips at the point of sale. But not all of these machines are compatible with mobile payments. Samsung Pay gets around this by allowing you hold your phone next to where you would normally swipe a credit card and then communicating with the magnetic card reader – this does enable your Samsung phone to work in almost all locations. We still have a lot of options and a lot of confusion. I anxiously wait for the a transition to a more standard system to evolve! A couple of years ago I attended a SIG event (Special Interest Group) focusing on augmented reality (AR) that was hosted by EvoNexus, a San Diego based, non-profit, technology incubator that helps accelerate the growth of entrepreneurial companies in the southern California area. They also provide excellent networking opportunities in the San Diego tech community. As an ole wireless, real estate guy with no technology experience, I lacked the vision at that time to see the practical implications of AR and couldn’t understand how it would play out in the market place. I believed it had value, but I wasn’t able to grasp it. Personally, the only application of AR I had experienced was the yellow, computer generated line that appears on television as the first-down indicator for a college or pro (American) football game. Now my vision is beginning to expand. The most obvious, well known example is Pokémon Go, the augmented reality game that uses the GPS on your iOS and Android smartphones to capture and even battle virtual creatures overlaid on real images through your smartphone camera. Pokémon creatures are everywhere and everyone is either playing Pokémon Go or making fun of people who do. The Md7 offices in both the USA and Europe and the Md7 team members are no exception. The first documented capture of a #Md7Pokemon was made by Lynn Whitcher, Md7 General Counsel, in our headquarters in San Diego. As she walked down our hallways, Lynn was surprised to find a round, fuzzy, purple Venonat peering around the corner at her. She captured the creature (once on camera, and again with a Pokéball) and an addiction was born! Lynn has even begun to become friendly with a few. Since the initial capture by Lynn and her subsequent befriending of the creatures, other Md7 team members have been also become friendly with Pokémon within Md7. Captures have been made from San Diego, to Seattle and all the way our Maastricht office in The Netherlands. The entire collection of photos can be found on Instagram via @md7llc and #Md7Pokemon. For those of us who are not into Pokémon Go but are interested in other examples of AR technology, checkout this recent article in USA Today that features “five more cool AR apps” – Yelp, Blippar, Google Translate, Crayola Color Alive and Star Walk 2. While I may not have fully appreciated the market value of augmented reality when I first heard about it at the EvoNexus, SIG event a couple of years ago, I see it now. And I also expect we will see a lot more of it in the near future. Mobile operators are facing a precarious landscape. They must provide increased bandwidth to supply anytime/anywhere video and data access and this can only be achieved through significantly densifying their networks. One of the best means to achieve densification is through the introduction of small cells deployed on light poles and other similar structures in dense urban areas. This rapidly evolving technology is new to most municipalities and communities who face their own challenges with the need to develop code while processing an abundance of small cell deployment requests. The Land Use team at Md7 has engaged in wireless deployments across the United States, both traditional macro as well as small cells. From this experience, we have seen firsthand the differences in the approval processes and development requirements from one municipality to another. Some municipalities have specific, well written guidelines which define small cells, approval timelines, and preferred site locations. Others are altogether silent on small cells and may not even be familiar with the concept, which is no surprise given the new technology and the difficulties in updating municipal codes. Just as the written code and guidelines can be very different from one municipality to the next, so too can the actual approval times. On the very same project, we have seen “City A” approve a deployment after a 30-minute meeting and submission of plans and photo-simulations, while “City B” takes 9 months, multiple meetings with City Planners, and multiple public meetings. Because of this disparity in how small cells are handled across municipalities, some states are considering new laws to help clarify the approval process, expedite responsible deployments, and provide a level of predictability that will allow industry-movers to accurately forecast and plan deployments costs. One such law, AB 2788, was recently introduced in California and then was subsequently pulled due to opposition. The supporters of this particular bill noted in an AB 2788 Coalition Letter of Support, that the stated purpose of this legislation is to accelerate the deployment of small cells in response to the demand for wireless broadband. Significantly more infrastructure is needed to keep up with the forecasted increases in mobile data and small cell technology is a key component to delivering the next generation of wireless technology to mobile consumers. However, it appears that this specific bill was causing heartburn with some municipal planners and citizens and thus it was pulled. Md7 has been in communication with a number of municipal planners that we interact with on a regular basis who expressed concerns about AB 2788. Specifically, they were concerned that the legislation did not address small cell aesthetics, noise, back up power, and the interplay of a bill like AB 2788 with Section 6409. While acknowledging those concerns, we believe that streamlining the process to deploy small cell technology is a necessary step, as the current regulatory environment is not working across the country. Small cell technology promises a great benefit to all parties, given that public safety is enhanced, consumer demand is met, and new macro site builds become less necessary in urban landscapes. As such, our initial reaction to AB 2788 was that we hoped municipal concerns could be addressed as the legislation moved forward. Md7 works to get “sites on air – faster”. We are pro-deployment and foresee small cell roll-outs as a large part of our business over the next few years. In that effort, our land use team works with municipal planners and law firms that represent them across the country every day. With that in mind, we are very encouraged by the conversations within our industry around the rapidly developing need for guidelines to deploy small cells. We have seen first hand the need for mobile operators and municipalities to work together to facilitate the inevitable densification of our wireless networks, particularly in dense urban and residential communities. Md7 remains optimisitic that a win/win solution will result – a win for wireless operators’ consumers as well as a win for the tax payers that the community planners represent, because they are one and the same. May 2, 2016 through May 6, 2016 marked OSHA’s construction safety week, more formally known as the National Safety Stand-Down to Prevent Falls in Construction. The Stand‑Down focuses on preventing fall hazards in all areas of construction, including tower construction and modification. Participation is easy. Companies are simply asked to discuss fall prevention with their employees. The wireless industry recently received a sobering reminder of the critical nature of tower construction safety. Inside Towers reports that two tower workers died last week. One man was electrocuted while decommissioning a tower in Wadesboro, North Carolina. He was holding a cable attached to a crane that came in contact with a live electric wire. During the same hour, another man fell to his death while working on a tower at a Damascus, Maryland water treatment plant. In the last decade, nearly 100 tower climbers were killed on the job, leading a top OSHA official to call tower climbing the most dangerous job in America. OSHA believes these deaths are 100% preventable. Md7 applauds the efforts of NATE to focus the industry’s attention on safety and best practices. With approximately 300,000 cells sites in the U.S. and 10,000 tower climbers in telecom, safety must remain a top industry priority. In-Building solutions– DA$, $mall Cell?, is Wi-Fi calling the answer? Carriers as well as third party infrastructure companies have been trying to address the tremendous growth in cellular traffic as well as customer expectations. With US cell phone penetration above 100%, a critical tool for carriers to differentiate themselves and gain or retain customers is network quality – commonly measured by the ability to initiate a cell phone connection (attainability), and to maintain that connection through completion (retainability). Data throughput is another key measure of network quality. Smartphone users often create their own perception of data throughput with the 10-second rule – if I don’t get my requested information within 10 seconds (sometimes less), I move on. That move may possibly be to another location or maybe even another service provider. Wireless service providers have been targeting large venues (public stadiums, hotels/resorts, large office buildings, campus environments, shopping malls, etc.) and specific geographies with full service DAS solutions or limited scope small cell deployments. Multicarrier DAS solutions are more complex and very expensive. Current small cell technology is limited to serving an individual wireless provider and proving somewhat difficult to cost effectively deploy, operate and integrate into the service providers’ overall network operations. Service providers can’t address the potential enormous demand for in-building coverage with DAS or small cell solutions. Is Wi-Fi calling the answer? Wi-Fi calling has been available for some time through downloaded apps like Skype, Viber and Whatsapp as well as boutique carries. Now the top mainstream wireless service providers have integrated Wi-Fi calling into their off-the-shelf smartphones. Some service providers consider Wi-Fi calls excluded from any allotted monthly calling minutes, others may not and international calling may have its own restrictions. Be sure to check with your provider if your objective is to reduce or eliminate minutes of use charges. If you have poor cellular coverage and have Wi-Fi enabled Internet connection, this can be a very viable solution. Typically, enabling Wi-Fi calling is activated through your phone’s settings and it requires connectivity to a private or public Wi-Fi network with Internet access. Are there any downsides to Wi-Fi calling? If you typically have Wi-Fi enabled on your smartphone and regularly use available access Wi-Fi networks there is probably very little impact. Making a call over Wi-Fi consumes very little bandwidth. Wi-Fi calling provides a good alternative for service providers to alleviate cellular coverage issues. However, data usage, e.g., music or video streaming, on-line gaming, or any high intensive application, is a separate concern. Herein lies the crux of the issue. Studies indicate over 60% of current smartphone data traffic is currently sent via Wi-Fi networks. Can we get even more data traffic over that local Wi-Fi network and into the Internet? Delivering additional data capacity may require a “bigger” Wi-Fi Internet pipe or additional service provider deployed capacity solutions such as higher speed backhaul, targeted DAS or small cell solutions. Public and even enterprise sponsored private Wi-Fi networks have security drawbacks. Where are your data and your transactions safest? If you are concerned connecting to a public Wi-Fi network, this solution may not be for you. The presumably more secure service provider managed connection may be your only option. On Thursday, January 28th, the California Public Utilities Commission (“CPUC”) voted unanimously to extend its ROW regulations to CMRS carriers, giving these carriers equal access to public utility infrastructure throughout the state. In making their decision, the CPUC pointed to the growing demand for wireless services and the need to constantly expand and augment wireless infrastructure due to these demands. The CPUC also said that facilitating investment in wireless infrastructure brings significant safety benefits through enhancing emergency communication abilities. The term “CMRS Carrier” was defined by the CPUC as all entities holding a current Wireless Identification Registration with the CPUC or a current Certificate of Public Convenience and Necessity issued by the CPUC that authorizes the certificate holder to provide Commercial Mobile Radio Service. As part of their final order, the CPUC set the rate and fees that public utilities can charge CMRS carriers for access to their utility infrastructure. CMRS carriers will have to pay the same make ready charges for access to the utility’s infrastructure plus the same annual fees for use of support structures (other than poles) as the CLECs and CATVs pay. Additionally, CMRS carriers will pay the same annual 7.4% (of cost of pole ownership) per pole attachment fee, as the CLECs and CATVs. However, instead of the flat 7.4% fee CLECs and CATVs pay, CMRS carriers will pay 7.4% per vertical foot of space that is dedicated to the CMRS attachment. This dedicated space includes the area needed for mandatory safety clearances. The CPUC noted that a single CMRS installation can occupy up to twelve vertical feet of pole space. Where more than one carrier makes use of the same space on the pole, the carriers will share evenly the costs for that vertical space. Pole attachment fees cannot exceed 100% of the host pole’s cost of ownership. The CPUC also reviewed new safety regulations proposed by its Safety Enforcement Division (“SED”). Over the last year, the SED held public workshops and solicited comments before making their recommendations on new safety regulations for CMRS installations. The CPUC adopted some of the proposed regulations such as prohibiting the installation of antennas on guard arms and requiring pole overturning calculations before a pole top antenna can be installed. However, other proposed regulations were rejected by the CPUC. Notably, the CPUC rejected the recommendation that all non-antenna equipment must be pad mounted which opens the way for pole mounting of this equipment. Additionally, they rejected SED’s proposed rule requiring load calculations for all new CMRS pole attachments. The CPUC pointed out that an existing rule already requires load calculations for a CMRS carrier’s first attachment and for all future attachments that materially increase the load on the pole. Material Increase is defined as an addition which increases the load on a structure by more than five percent per installation or ten percent over a 12 month span. The CPUC directed the SED to review whether the definition of “material increase” should be revised and to report back to the commission within the next 12 months. In addition to agreements with pole owners, local zoning approvals and permits will continue to be required for pole attachments. The new CPUC rules governing CMRS installations in the ROW go into effect on May 28, 2016.